This painting is about the first genocide of the 20th century – The Armenian Genocide. It was the Ottoman’s government systematic extermination of 1.5 million Armenians, mostly Ottoman citizens within the Ottoman Empire and its successor state, the Republic of Turkey. The starting date is conventionally held to be 24 April 1915, the day that Ottoman authorities rounded up, arrested, and deported 235 to 270 Armenian intellectuals and community leaders from Constantinople to Ankara, the majority of whom were eventually murdered. The genocide was carried out during and after World War I as well as implemented in two phases: the wholesale killing of the able-bodied male population through massacre and subjection of army conscripts to forced labor, followed by the deportation of women, children, the elderly, and the infirm on death marches leading to the Syrian desert. The Armenian prisoners of war not only suffered physically, but also were mentally tortured as it is shown in this painting. 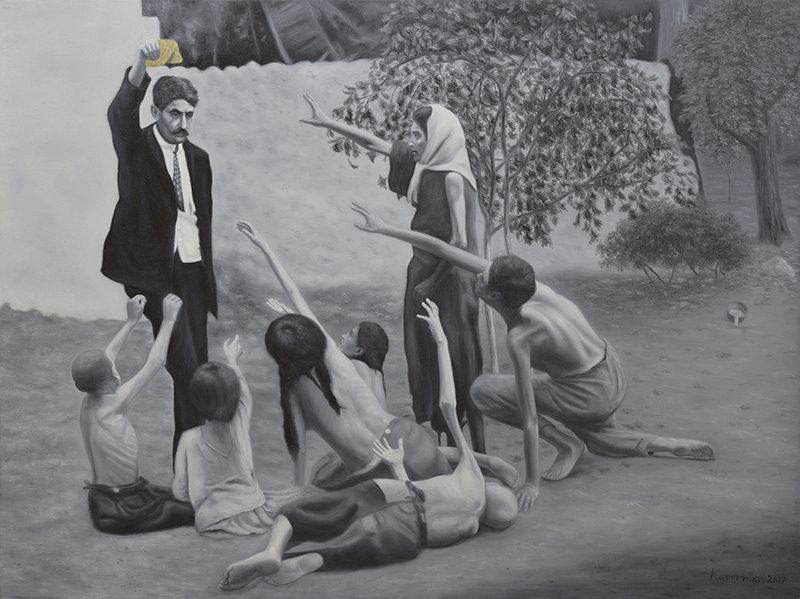 This painting was inspired by a photograph of the Armenian Genocide, where a Turkish man is teasing starving Armenian children and a woman with a pita bread as if they were dogs or worse. These starving children expect to get food from this man without knowing that this was only his way of getting joy from their suffering. I took some artistic licensing in this painting and took out a few elements, which were distractive to the composition, such as the bag next to the figure on the far right. However, I didn’t want to make up a historical painting, and wanted to bring an old photograph into more detail as well as into life with a painting. This in general was an immensely difficult task technically, but I chose this photograph because of the powerful composition and because of the story it tells. Today, Turkey denies that there was any genocide of the Armenians in the beginning of the 20th century and it is a shame. I’m not blaming the current Turkish civilians for this, as they had nothing to do with this crime against humanity over 100 years ago, just as the modern Germans of 2017 mostly are not Nazis, and didn’t first hand participate in the Holocaust as their ancestors might have. The difference between the two is that the Holocaust had been forced to be recognized as a genocide by the German government, and the Turkish government hasn’t recognized Armenian Genocide, denying the term “Genocide”. The Armenian Genocide is the great injustice of the 20th century that is unresolved. I believe it’s the Turkish government’s responsibility to acknowledge what happened. I have many Armenian friends, but this concerns me not just because of that but also as an unfair treatment of an entire nation of people whose ancestors endured great suffering. Armenian Genocide is just as important as the Holocaust. One of the reasons why it is so important is of course that over 1.5 million people were murdered. Another reason is that, it was the prototype genocide for other ones to follow. Hitler himself mentioned in one of his speeches that nobody remembers the Armenians that were killed during the genocide. He said that to reference to the later horrors him and the Nazi party would commit. Among the victims of the Armenian Genocide, weren’t only Armenians, but also Greeks (450,000–750,000 casualties), Bulgarians (300,000 casualties) and Assyrians (150,000–300,000 casualties). We need to remember all of the men, women, and children who were killed in this event. If we allow this to pass unrecognized, then it will encourage future genocides to occur of which already happened such as The Holocaust and the genocides that happened/happening in East Africa as well as in the Middle East. May all of the victims of the Armenian Genocide rest in peace. I did this piece out of moral (not monetary) reasons to bring awareness, so hopefully events like this stop occurring world wide. The only way this tragic event could now serve a purpose for future peace, is if it’s internationally recognized. The world needs to unite together to prevent such tragedies. I put my heart and soul into this painting, spent hundreds of hours perfecting each detail. I used a Dutch/Flemish old master approach to painting this piece, inspired by Rembrandt van Rijn.